It was the Wabbit’s birthday and he crept out early for some peace and quiet. To fool everyone, he took Franco’s jeep instead of his own and he was merrily bowling along singing a favourite song, when his radio crackled. "Sweet Wabbit, Happy Birthday! Where are you?" said Lapinette. "Bowling merrily along," said the Wabbit. "Lovely," said Lapinette, "do have fun. Don’t forget your official function and to pick up your cloak from the laundry." The Wabbit’s ears stood on end and he felt in his fur for the ticket. 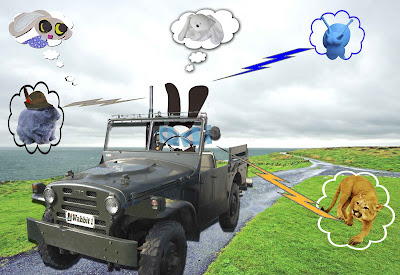 For a moment all was quiet and the Wabbit sniffed the sea breeze. Suddenly another voice broke in. "Commander, someone’s stolen my jeep," said Franco. "I have it Franco," said the Wabbit. "That’s a relief on your birthday Sir," said Franco and he signed off. The Wabbit was just about to turn on his FM radio when the handset crackled again. "Wabbit, happy birthday," said Puma. "It’s about my adventures, I need to play a bigger role," "Later Puma," said the Wabbit and turned up the dial to hear Fabio Treves on Wablantis Radio. But the music stopped and another voice cut in. "Happy birthday," said Snail. “I was wondering whether you have my screwdriver kit." "In the shed," said the Wabbit and he turned Wablantis up higher. But his handset crackled yet again. "Woooooh!" said a ghostly voice. "Oh hello Ghost Bunny. What can I do for you?" "Enjoying your birthday?" asked Ghost Bunny. "Yes, I’m out for a quiet drive," said the Wabbit. "I made a radio request for you," said Ghost Bunny, "and they’re playing it now." The Wabbit turned the radio up full blast. It was BB King singing Happy Birthday Blues and the Wabbit grinned with all of his 28 teeth and sang along.